While in Chicago with my mom back in November, we had lunch at this fabulous little neighbourhood restaurant called Birchwood Kitchen (merci vicky for the recommendation). It was one of those restaurants where everything on the menu tempts you, and you leave your decision to the very last minute and just trust your gut. I chose mushroom ragu on toast (think something like this), and my mom ordered a roasted squash salad, with chickpeas, wheatberries, hazelnuts and pecorino. To say that we were happy with our choices would be an understatement. We left with full bellies, big smiles, and a promise that I would attempt to replicate my mom's dish once back home. It may have taken a little while, and I may have abandoned a few ingredients along the way, but I never break a promise - had to get it just right. Enjoy! 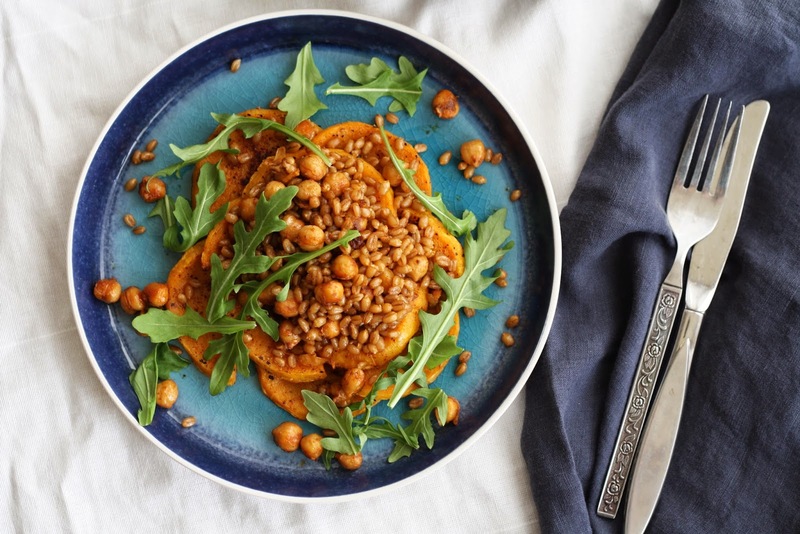 The wheat berries can easily be doubled if you want to make the dish a bit bigger. There will be enough dressing for it, and it won't detract from the balance of the dish - promise! 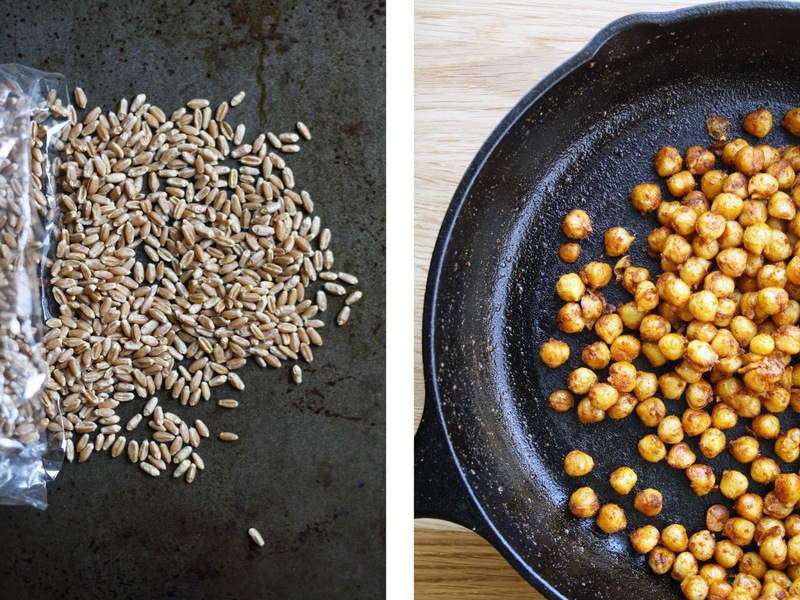 In a medium size pot, combine water and wheat berries. Bring to a boil, stir, reduce heat to low and cover for 1 hour. Strain excess water. Cut the ends off the butternut squash and carefully, using a carrot peeler, peel off the skin. Slice lengthwise in half, and then cut into 1/4"-1/2" half-moons. Remove seeds and stringy bits as required. 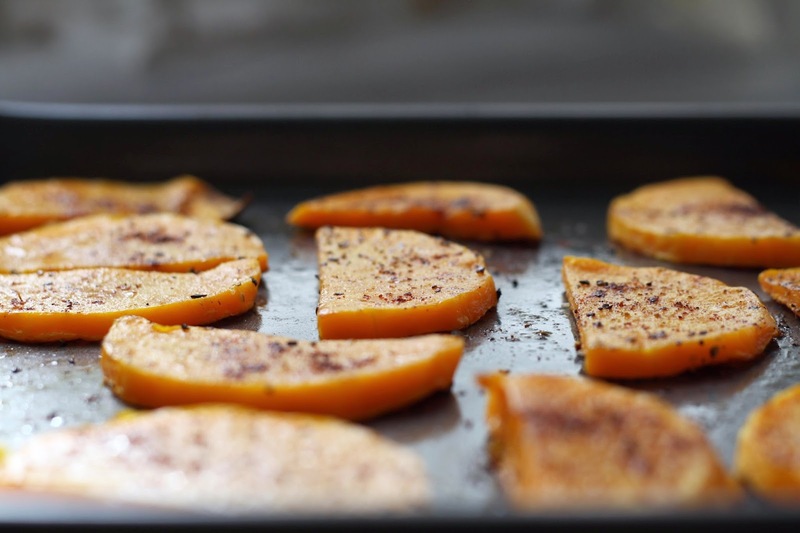 Toss the squash in a bowl with the olive oil, chili powder and a dash of salt and pepper. Spread onto a rimmed baking sheet, and roast for 20-30 minutes, until soft, but still holding its shape. Make the dressing by combining all the ingredients in a glass jar. Seal the lid and shake vigourously. Set aside. Wait until the wheat berries are ready before starting on the chickpeas. In a cast iron skillet over med-high heat, warm 2 T olive oil. Add the remaining spices and stir gently until fragrant and bubbling. 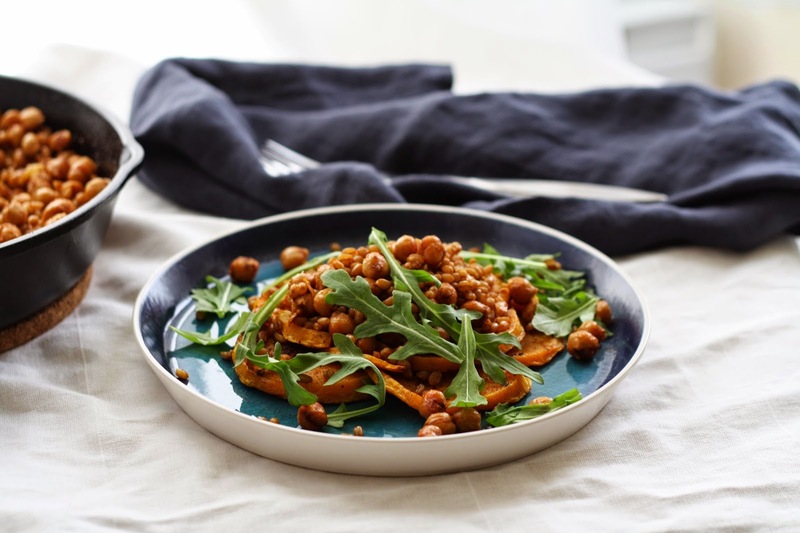 Add the chickpeas, and roast until crispy, about 10 minutes, stirring to spread the flavours and avoid sticking. Turn the burner off, add the wheat berries and 2-4 T dressing and stir to combine. 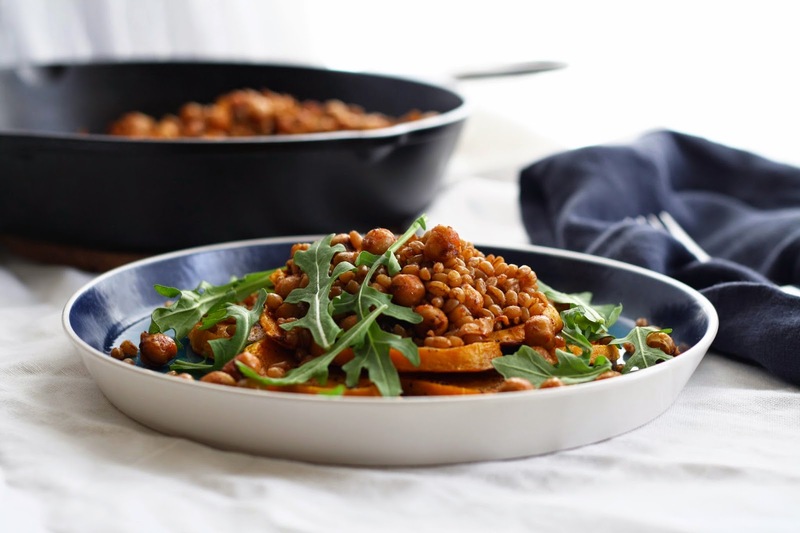 When ready to serve, plate a few slices of squash, followed by a heaping scoop of wheat berry/chickpea mixture and a handful of greens.